Don’t Call It a Crash! A Feast for the Eyes: National Parks Across the U.S.
Boston has an underbelly. Everybody knows about the patriots and Paul Revere and the great universities and hospitals and Brahmin lifestyles and winning sports teams, but one of the more quirky and surprising tours that visitors (and residents too) can take from the 40-year-old Boston By Foot organization reveals a completely different view of this fair city. 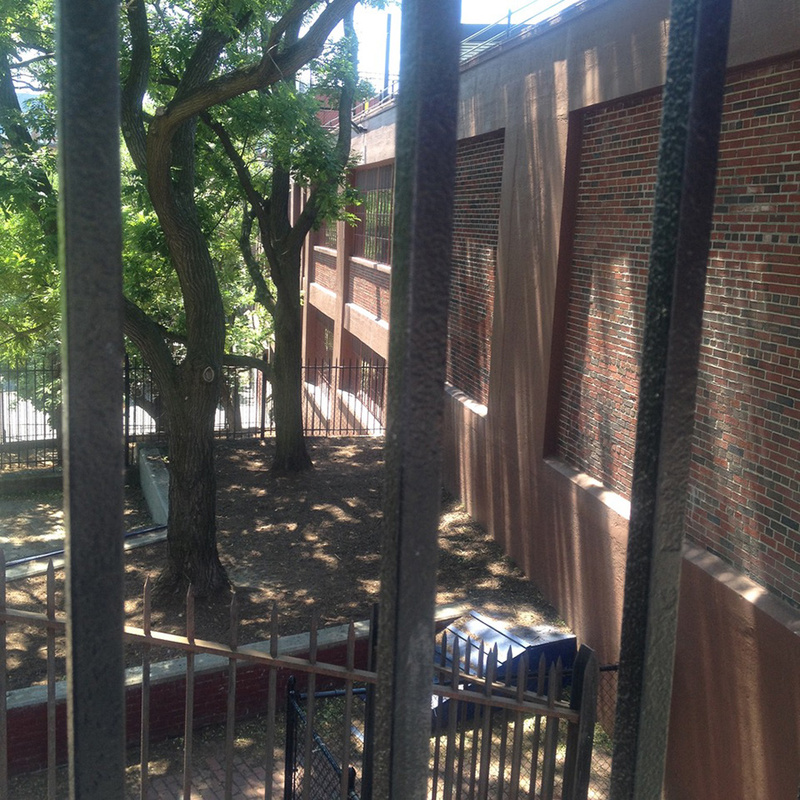 Copp’s Hill Burial Ground: It was legal for medical students to use cadavers. Massachusetts General Hospital suggested that they send their students out to Copp’s Hill at midnight or later, to dig up bodies for that use! Photo by Julie Hatfield. Boston has an underbelly. Everybody knows about the patriots and Paul Revere and the great universities and hospitals and Brahmin lifestyles and winning sports teams, but one of the more quirky and surprising tours that visitors (and residents too) can take from the 40-year-old Boston By Foot organization reveals a completely different view of this fair city. Called “The Dark Side of Boston,” the tour shows that the old town wasn’t always the shining example of its Puritan roots. Bad things have happened in Boston, from the very earliest times, beginning in the 1630’s when Boston Harbor brought ships into town and was called a “sailor’s playground.” According to the guide on this walking tour which takes place in the North End, the Richmond Street area, today a lovely neighborhood of upscale residences and restaurants, was also called “The Black Sea,” a very dangerous place, filled with gambling halls and “dram” shops, or bars, and houses of ill repute. Boys under the age of 13, who were not allowed in the bars and dance halls, created their own brand of fun, called “ratting.” Each boy would find 20 live rats and throw them into a corral along with a mean and hungry street dog. They would take bets on how long it would take for the dog to kill the rats – 15 seconds was considered a good time – and whoever’s rats were killed the fastest won the money from the bets they all had made earlier. This is North Square, in Boston’s North End, an area that in the 1600’s was a rough area where saloons and houses of ill repute entertained the many sailors who arrived in town, and where boys under the age of 13 went “rattling,” a contest with mangy hungry dogs to see how many rats they could kill. Where once smallpox killed Bostonians. Sailors brought smallpox here to Boston but Cotton Mather figured out how to inoculate for it and stopped the plague. Photo by Julie Hatfield. 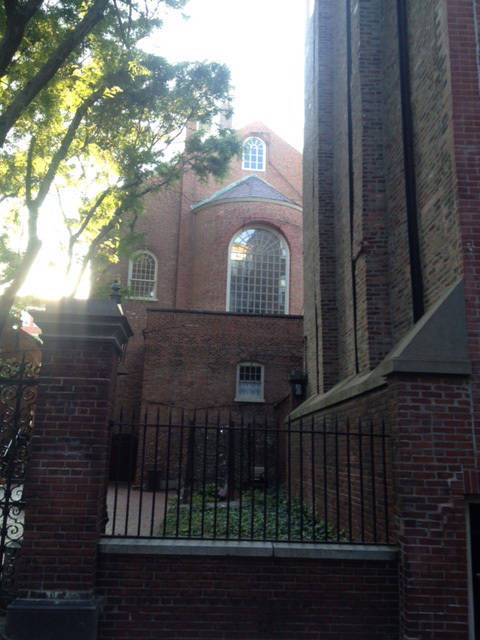 The Old North Church, made famous by Paul Revere’s midnight ride, once was located in North Square, the center of life here in the 1700’s. The church has moved a few blocks north and now, in its place, sits Mama Maria’s, the most elegant Italian restaurant in the North End. During these same years, the pews of the Old South Meeting House, a few blocks to the west, were torn out by British soldiers to make it into a stable. Cotton Mather, the famous minister and judge of many of the Salem girls and women deemed witches in that town north of Boston, had also studied medicine, so he had his good side and his bad side. When he deemed Goody Glover, a laundress for the Goodwin family accused of stealing their linens in addition to washing them, a witch, she was one of four women hung on nearby Boston Common. Glover had come from Ireland, and when she said the Lord’s Prayer upon hearing her fate, she said it in her native Gaelic, and the locals thought she was talking gibberish, all the more reason to believe her a witch. When 60 sailors arrived in Boston in 1721 they brought with them the smallpox epidemic. Mather, who had heard from a black servant that people in his country of Africa had figured out a way to avoid the illness by transferring the pus of an infected person into a scratch on a healthy person, encouraged Dr. Zabdiel Boylston to try this as an inoculation. Strange as it seemed at the time, Dr. Boylston tried this on his own son and two slaves, with the happy result that smallpox was eventually eliminated. What’s left of the beautiful home of Royal Governor Thomas Hutchinson still sits on Garden Court Street, across from the childhood home of Rose Fitzgerald, who later became the matriarch of the John F. Kennedy clan. Angered by the Stamp Act and other taxes put on them by the British, Boston mobs rioted 28 times between 1765 and 1775. The worst mob tore into Hutchinson’s house – he and his children had escaped earlier– and left it in ruins. He returned to England where he later died. Famous crimes continued to darken this neighborhood in the early 1900’s, when notorious forger Charles Ponzi created a scheme of theft using postal reply coupons. When Ponzi was finally declared guilty, he served his time and afterward left for Florida, where he sold swampland to unsuspecting buyers. This is also the neighborhood where explosion anarchists Sacco and Vanzetti lived and were put to death at the Charlestown jail in 1927. 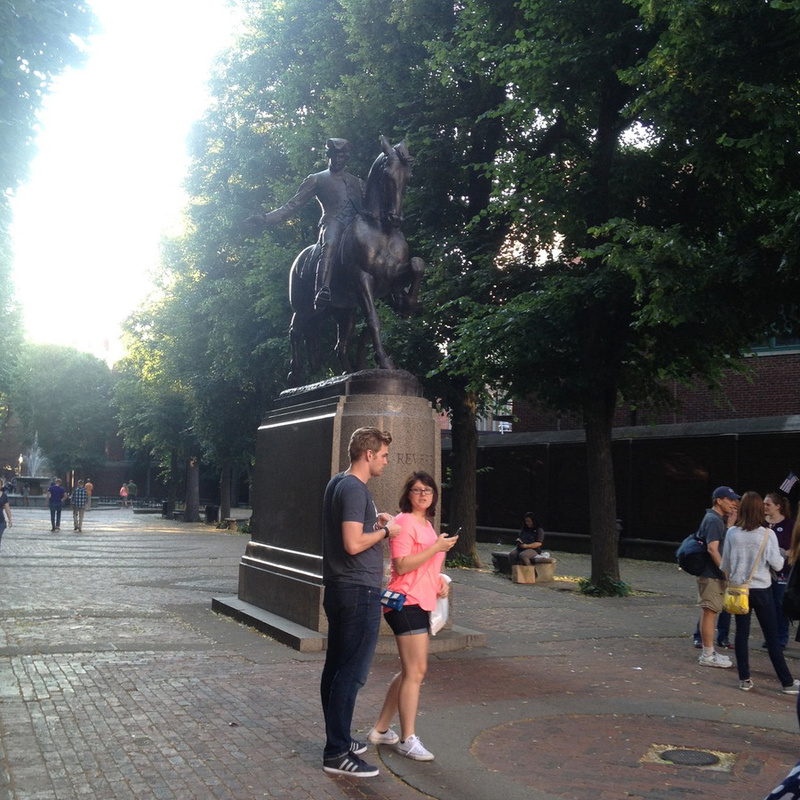 Here, where now the statue of Paul Revere on his horse stands, was where Ponzi, of famed Ponzi scheme, as well as Sacco and Vanzetti, who were killed for their supposed bank robbery, lived. Photo by Julie Hatfield. Now a bocce ball court for Italian men who live nearby, this was the site of the Great Molasses Flood, when thousands of hot molasses broke through a rickety barrel holding it and rushed at 30 mph into the street, killing 21 people, knocking down building in the way, and causing a horrific mess. Photo by Julie Hatfield. 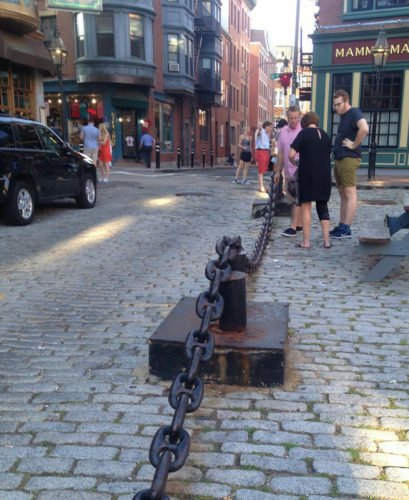 This is the area in the North End where the infamous Brink’s Robbery took place, one of the biggest heists in history. Now the area is a lovely upscale residential area. Photo by Julie Hatfield. In 1849, Dr. George Parkman, a respected Beacon Hill surgeon and real estate tycoon, went to the home here of John White Webster to collect rent money. He disappeared and was never seen again, until a janitor crawled through the pipes from the Charles River to Webster’s house and found teeth and bone fragments in the furnace. Among character witnesses for Webster was writer Oliver Wendell Holmes, and not until Dr. Parkman’s dentist came to the courthouse with a mold of Dr. Parkman’s teeth was Webster found guilty of the murder. Copp’s Hill Burying Ground just up the street from the current Old North Church is one of the oldest cemeteries in Boston. 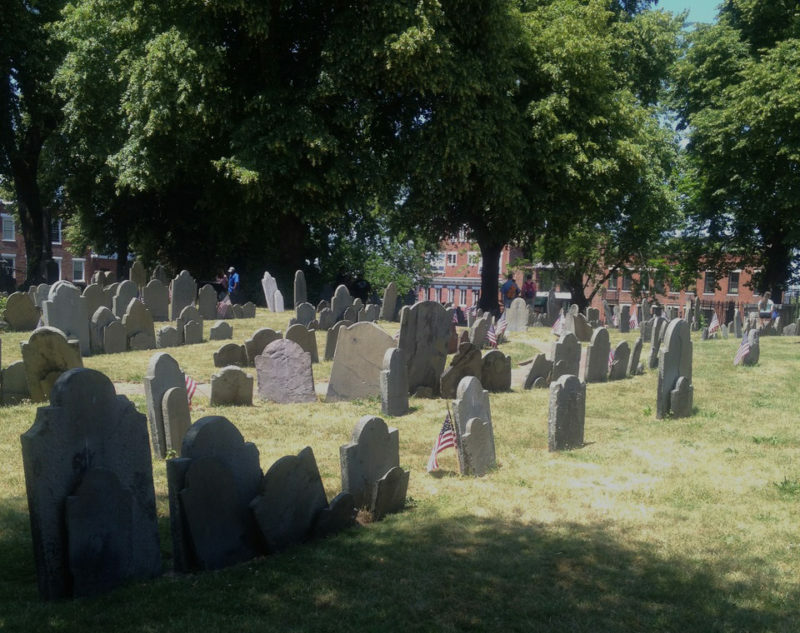 At the beginning of the 18th Century, it was an active scene for grave robbers, especially Harvard Medical School students who were told to dig up cadavers for medical study, an illegal activity until the Massachusetts Anatomy Act of 1831. The grave robbers of the time were called “resurrectionists.” During the Revolutionary War, doctors also found and used the bodies of dead soldiers who had no known relatives and were not claimed. Also in the 1800’s in this same neighborhood, “Jolly Jane” Kelly, whose mother had died and whose father had given her to a family as an indentured servant, went to nursing school and began mixing morphine and atrophine while at Cambridge Hospital and later Massachusetts General Hospital, poisoning a number of patients before her crimes were discovered. “She liked to climb into bed with the patients in order to listen to their last breath,” noted the guide. 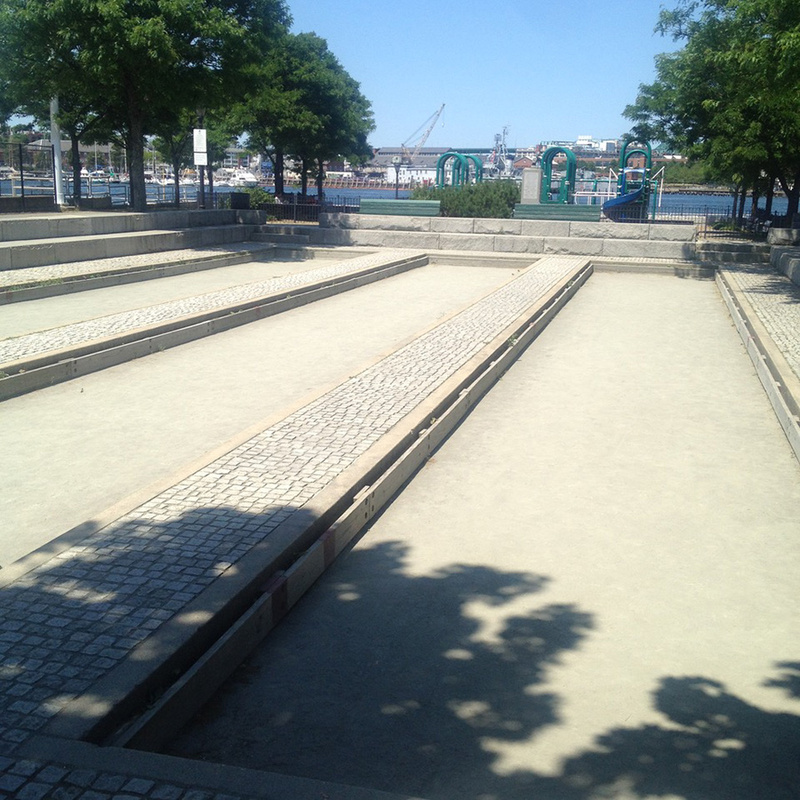 Older Italian men love to play bocce ball in the bocce court down by the waterfront in the North End. It was not so peaceful here on January 15, 1919, when the enormous tank of 2.3 million gallons of hot molasses exploded, pouring into the street at 35 miles per hour, crushing buildings in its wake, injuring 150 and killing 21 people. The molasses had been used in triangular international trade, with Boston importing molasses from the Caribbean, which in turn received lumber, cheese and flour from Boston. The city made the molasses into rum, which they traded with Africa, for slaves. But the molasses tank was in bad shape even before the explosion. Some residents of this area claim that on certain days they can still smell the molasses. One of the last big crimes in this neighborhood – and it was a whopper – was the January 19, 1950 Brink’s Robbery in which $2.3 million was stolen in 20 minutes by a gang that had a locksmith among them who made keys from the locks of the doors of the garages housing the armored vehicles. One of the robbers, James “Specs” O’Keefe, ratted out his buddies and the crime was solved, after which $28 million was spent recovering the original $2.3 million. Today, where the Brink’s Robbery took place, there is a pretty public park. The crimes are not so spectacular now. The neighborhood is calm, peaceful and gentrified. But this tour, at $15 per person, brings chaos, illness, mayhem and dark history strikingly to life for a fascinating hour and a half. The tours run through October. Check out www.bostonbyfoot.org. 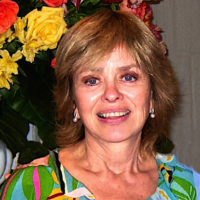 A staff reporter for The Boston Globe for 22 years, Julie morphed into travel writing after she left the Globe and has been writing for the Globe and other newspapers, magazines and travel websites since. She has produced several apps, one of which is available on iTunes and is called “Boston Arts & Culture.” For visualtraveltours.com she has produced apps on Baltimore, Boston, and Las Animas Wilderness Retreat in Baja Mexico. 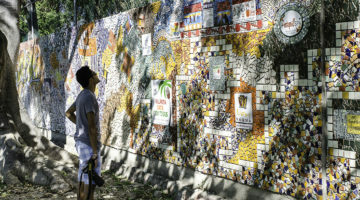 She has produced a dozen travel videos for travelvideopostcard.com, which can be seen on YouTube. Kokopelli Cave Experience: The Anasazi Never Had It So Good! During the holiday season, guests come to Silver Dollar City, an 1880s-style theme park in Branson, Missouri, for the park’s An Old Time Christmas festival, one of the country’s most recognized events for spectacular lighting and entertainment. TravelWorld Magazine Copyright © 2018. All rights reserved.